Buses were abandoned in their depots, planes were grounded, mainline rail services disappeared and most of the tube gave one last gasp and died. Many have seen this as a failure of technology to cope with the elements and have called for investment in new snowploughs and equipment to deal with the problems. 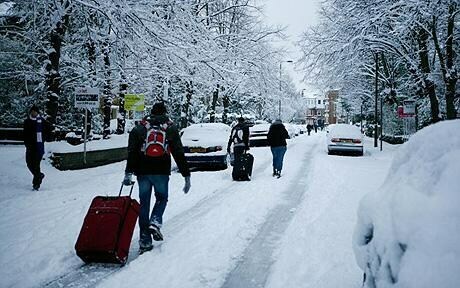 But Boris was right, this would have been a waste of money for a city that only occasionally sees heavy snow – especially when London’s problems had little to do with machines and everything to do with people. Many wondered how underground lines could be shut by snow. Because most of the drivers had failed to turn up for work, of course! Similarly, the buses were prevented from moving because of the risk to public safety. Transport for London said all buses – which would normally carry 6 million people on an average day – had been withdrawn from service “due to…dangerous road conditions” endangering the public. So was this a strike by another name? Did everyone just need a day off? Well, it’s certainly true that for just a few hours people forgot about the credit crunch and concentrated on the crunch beneath their feet. That can’t be all bad. ‘Travel with style’, is a phrase I always try to keep in mind whenever I frequent public transport. I apply this to my coat, shoes, handbag, and then accessories. This includes my phone – phones plural now actually, as I recently acquired a BlackBerry – something I’m really starting to like. However, I was browsing the internet today at work, and I noticed an announcement about the ‘credit crunch phone’. 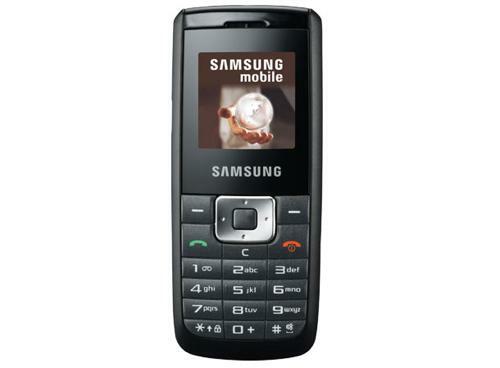 The new Samsung B130 costs just £4.95. £4.95!! Amazing. Despite times being hard though – do we really want to sacrifice style when for about £50 more you could get a reasonably better looking phone? Who in their right mind would want to whip out a phone that looks like this on their daily commute, when it would ruin the rest of their stylish attire? Call me shallow, but these things are important to some people – myself included! …can bring up some interesting finds. I enjoy people watching, as does pretty much 100% of the population, and for me one of the best places to do this is on the Tube on my daily half hourly commute into work. It’s for this reason I’ve decided share with you all my foray into the world of 30 minutes on the Tube. Angry: Phone is not working and this causes rage in the owner of said gadget. I witnessed the ‘angry’ face this morning. A businessman, aged about 30 I’d say, pulls out his phone to check his emails/text messages so far for the day. It’s a new phone, very stylish and modern. He tries turning it on – but to no avail. He looks around, and tuts, once, very loudly. He tries taking off the back cover, checking the battery’s in there, and starts muttering, probably some form of expletive under his breath. He tries turning it on again. It’s simply not going to work. And then, out comes the ‘angry’ face. It’s amazing how we rely on technology and mobile phones in particular, and when they fail it’s seen by some, possibly many, as an absolute catastrophe. The ‘happy’ face and ‘surprised’ face weren’t present on the Tube today, maybe they got off before I got on? Either way, they don’t travel as regularly as the ‘angry’ face – especially when mobile phones are involved.